Kent Hovind Runs Off Again! – Kent Hovind v. Robert Baty – The Great Debates! Home→Kent Hovind Runs Off Again! 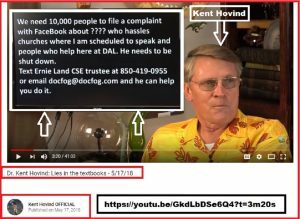 On May 17 and 18, 2018 Kent Hovind and his handler Ernie Land launched a campaign against me, Robert Baty, calling on 10,000 of Kent’s followers to complain to FaceBook and have me silenced therefrom. Following is a record of Kent’s launch of his campaign against me and the discussion that followed between Ernie Land and me. 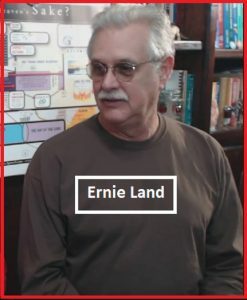 Ernie Land indicated he would, on behalf of Kent Hovind, accept my proposal that we debate, and almost immediately Ernie Land tucked tail and ran. So you call Ernie. There’s his phone number. “Ernie, how can I help”. Say, “Ernie how can I help”. Let Ernie take care of that. that God will put a stop to it. would not come against us. The man is Robert Baty. to create issues for Dr. Kent Hovind. Link to discussion thread on FaceBook page of Peter J. Reilly wherein Ernie Land and I exchanged the messages below regarding the debate and related matters. Yes, Hannah was influenced by Theo’s false narrative, but take notice, she “wanted to avoid the stalkers”. Baty, you make unwanted calls to many of the contacts of the Ministry under the false guise of informing them of your twisted evil views. That’s why you get in Facebook prison often. Say it ain’t so. It’s called stalking when they do not want your comments and could care less about your lies. That is the complaint and why Baty ends up being tossed off facebook to start a new page every year. Kent refuses to deal with. Baty, you are the one of those calling people up unwanted and responding on Facebook with undesirable comments. You have created the calls and every agency in the State of Alabama and most Churches Doc speaks out have had enough of your stalking and narratives, but God works for those who love the Lord and are called according to his purpose, so your intent of evil has actually ticked one Pastor off to a point he plans to open up 13 Churches for Doc to speak at and 2 schools. Let me know when you are ready to come out of hiding and openly, honestly address matters of substance regarding Kent Hovind and his false legal narrative. So Baty, have you contacted Churches or Church leadership where Kent is speaking posted on our site? We get calls of complaint against you and your trolls saying that is a fact. Come on down and we will film a debate with you in our studio and expose who is the liar. I take your challenge, so when? 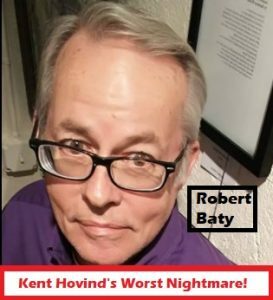 KENT HOVIND v. ROBERT BATY. Is it about to happen? Of course, that is not how debates are set up, but it may be a good start if Ernie is serious about putting his man Kent Hovind up against me regarding matters of mutual interest. Will Ernie even seriously, in good faith, bring out Kent to negotiate the appropriate logistical details with me or have him formally designate Ernie as his negotiator so we might proceed. I propose that there are a number things that we might resolve, and allow Kent/Ernie to show their good faith in accepting my debate proposal stated above. 1. That Kent Hovind does actually commit himself to personally debating me. 2. That we agree as to whether or not it will be written or oral; I prefer written. 3. That we agree on the issues to debate. Once we resolve those issues, we can proceed to resolve other logistical details. 1. Have Kent broadcast on YouTube his acceptance of the proposal and acceptance by Ernie that he personally debate me. Kent’s written acceptance should also be announced on one or more Internet venues of his choosing. 2. The debate should be in writing, but, if Kent Hovind wants to publicly refuse a written debate, I will accept an oral debate contingent on resolving the requisite related details. – that total more than $10,000. 3(b). Ernie seems to think Kent wants to affirm some proposition regarding my contact(s) with people and/or organizations that have scheduled Kent to perform. I will let Ernie/Kent work on whatever proposition they want to suggest that they might affirm to my denial and consider it. So far, it appears they cannot agree on just what they might want to accuse me of, specifically, personally. If they can come up with an appropriate proposition to affirm, and which I might deny, we are set. If not, I will gladly let them suggest any other relevant proposition of mutual interest. We have dozens reporting to Facebook and there has been libelous statements there over long periods of time. Oh that debate, easy and now done, over and out. 31 U.S. Code & 5324 enacted by Congress to catch drug traffickers, racketeers, and/or terrorist (Not Ministers, and Kent was none of those the law was enacted to catch) and it leads in with “Structuring transactions to EVADE reporting requirement prohibited. Kent just removed the weekly funding to run his Ministry. As noted all transactions were less than $10k and ranged from $4k to $9k per week with very few multiple withdrawals in a week, over the entire year, also noted the deposits ran very similar, and guess what, no one can plan deposits on a Ministry, so the law or shall I say the biased Judge failed to render justice. But you can still come down to DAL and we will record that for public viewing anytime you wish. You have no idea how to be open and honest and produce a proper exchange of ideas (i.e., a debate), do you. My offer, which you accepted, stands. Now, are you and Kent going to keep hiding out and lying and trying to control the narrative, or are you going to work with me, in good faith, to produce that debate? Looks like you have already determined to run, but I am longsuffering and will give y’all another chance to get serious and man-up to the offer you accepted. You are correct I don’t do debates often so I am not experienced, but I answered you debate question above and it is the end of the debate of opinions because i quoted the code and the reason Congress enacted the code. I then laid out the FACT that Kent was not the code target and that he did what the unjust Court called structuring as a day to day operation of funding his Ministry. What is left to debate, NOTHING! Kent’s claim remains open for debate and what you had to say about it, Ernie, in no way supports Kent’s years’ long claim and is false and/or misleading, and I think you know that and I think Kent knows that. Let me know if you and Kent repent and decide to get serious about “facing” me on substantive matters of mutual interest. I also note that dared not try to repeat your specific accusation against me regarding contacting 3rd parties regarding Kent.